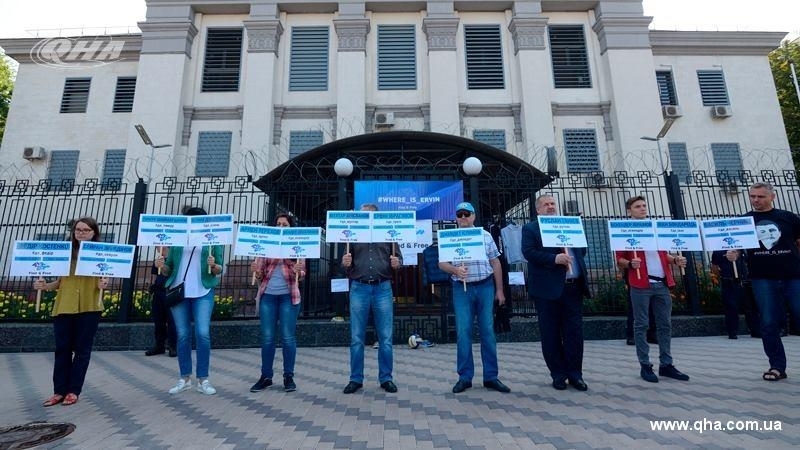 A monthly campaign was held in Kyiv outside the Russian embassy in support of the victims of enforced disappearances and their relatives in the occupied Crimea. This time the action is timed to the UN World Day for Enforced Disappearance. “For the entire period since the beginning of the annexation of Crimea, 44 people were kidnapped at the territory of the peninsula. Most of them were released. It was at the beginning of the military operation of the Russian Federation on the territory of the Crimea. Some of them, were found dead, like Reshat Ametov, some were found in places of confinement. Today we are talking about 15 people we consider to be victims of enforced disappearances,” Coordinator of CrimeanSOS Tamila Tasheva said during the action. The activists organized a performance called "Beacon of waiting". Personal belongings that reminded relatives of the disappeared were brought to the Russian Embassy. "The ball is a symbol, a beacon that constantly reminds Ervin Ibragimov’s father of the fact that Ervin loved to play football. Before the abduction, he constantly did it, arranged the championships. And this is the grapes, the family of Ruslan Ganiyev told us about. He was fascinated by many things, but in the last period before being abducted he was growing grapes,” Tasheva said. According to the Chairman of the Mejlis of the Crimean Tatar people Refat Chubarov the action is expected to awaken the Ukrainian society, rather than to influence the behavior of the Russian leadership, because this requires more substantial measures. “We are aware that such actions near the embassy of the aggressor country do not affect the behavior of criminals sitting in the Kremlin. But we held them and will hold them, because it is very important for us to awaken the Ukrainian society, not to let it fall into despair again and be deceived in certain decisions," Chubarov emphasized. Reference: International Day Of The Victims Of Enforced Disappearances was established by resolution No. A / RES / 65/209 of the United Nations General Assembly in 2011. Adoption of the document was caused by the use of enforced disappearances to create an atmosphere of terror. Enforced disappearances are widely practiced by the Russian occupation authorities in occupied Crimea from the outset of aggression in 2014.